WhatsApp has extended the Delete for Everyone duration from 420 to 4096 seconds (68 minutes and 16 seconds.) 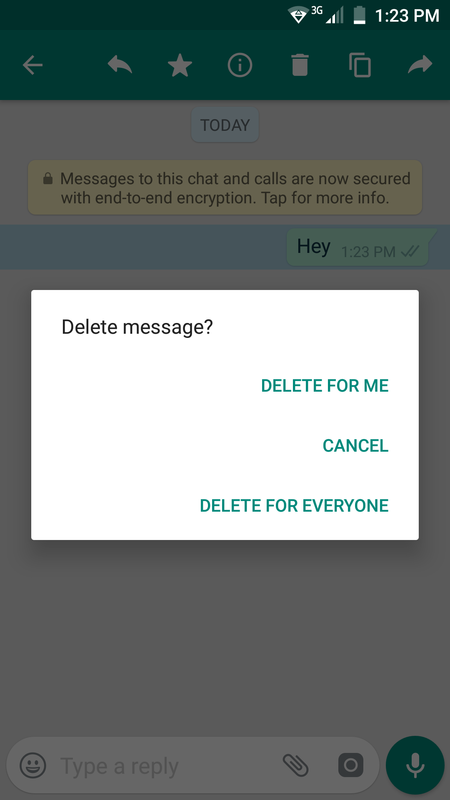 The Facebook-owned platform WhatsApp has added the message delete feature to the beta users previously and now the feature is available to everyone. The message which already been delivered to someone can now be deleted from their chat within 4096 seconds of sending the message. This extended time to delete the message on the chat was earlier spotted by WABetaInfo on the previous WhatsApp beta build with version number 2.18.69. iOS users were expected to get this update as well after a smooth rollout on the Android version. WABetaInfo said that the latest version of the WhatsApp (including beta) has received this update. WhatsApp released this feature to delete the message even after delivery in October last year which enables users to delete the messages sent by accident. This feature is similar to the Gmail’s “Undo Send” options but in Gmail, the duration to undo the message is less than in WhatsApp. WhatsApp’s new feature protects the users from the fake apps which claim to delete the three-year-old messages on WhatsApp. The new feature called “Block revoke request” which notifies the recipient whenever the sender is trying to delete already sent a message. The message which has been sent by the algorithm contains the same ID as the one which user wants to delete. This update will disable the people to fool around the system via any modded versions of the application. This new update brings the improvement to sticker feature and the adaptive icon support for Android 8.0 Oreo.